The third in this series of ‘Under The Hood’ events was our first technical event in Glasgow and it was a tremendous success! 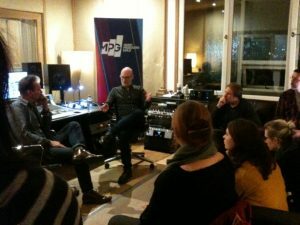 Hosted again by producer and MPG Executive Director, Andrew Hunt, the event took place at Chem19 Studios. This time on the ramp for inspection was the Slate Digital VMS (virtual microphone system). A system that claims to emulate no less than eight classic mics and two pre amps (Neve 1073 and Telefunken v76). 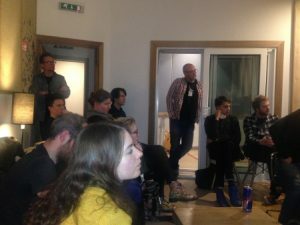 Our esteemed panelists, who rolled up their sleeves & got under the hood in front of a capacity audience were producer/engineer Paul Savage (Arab Strap, Mogwai, Teenage Fanclub, Franz Ferdinand and Chem19 owner) and Paul McGeechan (Friends Again, Love and Money). Unfortunately our third panelist, Greg Kane (half of Hue & Cry) had to cancel at short notice due to an unexpected family situation. The system consists of a Slate manufactured large diaphragm condenser and Slate pre-amp, which connect erectly to you DAW via your converters of choice. The processing and emulation happens post recording. 1. How easy is the system to configure? Answer: Extremely. No more complex than installing a plug in. 2. Can the mic and pre amp be used separately in their own right? 3. Can the emulations be monitored through whilst tracking? 4. Can the emulations be changed after tracking? As the emulations take place after recording we suspected that the answer would be no! We’d planned a Skype call with Steven Slate himself later in the evening, so this questions was the first on the list. Not wanting to waste time experimenting with this at this stage we thought we’d move on to the main event. We kicked things off by seeing what the Slate system sounded like unprocessed, as a natural mic/pre amp. 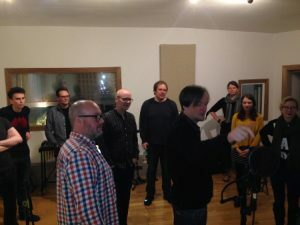 We were privileged to have singer and The Delgados founding member Emma Pollock [http://emmapollock.com] on hand. It was unanimous amongst all present that as a stand alone system, the Slate VMS is a detailed and clear albeit uninteresting and a little light as a vocal chain (this is not meant as a negative by any means). Emma was singing to a backing track, so next we recorded the same vocal passage on Chem19’s Bock 251. As one of the pre amp emulations offered by Slate is a Neve 1073 (software), we thought it fitting to use one of the Neve 1073 hardware pre amps in our comparative chains. The Bock 251 is not a cheap mic by any means (approx £5.5k) and is known to be a high quality replica of the revered Telefunken ELA M251. If this were a technical shoot out, we would have course recorded the vocal passage simultaneously with both mics at an equa-distance etc etc. But again, this is not what happens in a session and therefore, not the aim of the event. On the Bock 251 there was a sense of ‘wow’ at the sound. It was detailed and light, yet musical with body and air that gave dynamics and emotion. 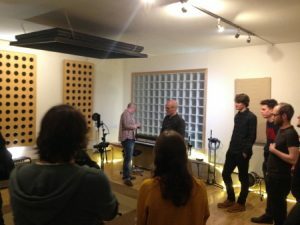 As a stand alone mic it was clear that there was no comparison in ‘quality’ or ‘musicality’ and there were doubts as to the worth of the exercise. The room was reminded that we hadn’t tried the emulations yet and furthermore, at $1000 the Slate system is less than 1/5th the price of the Bock mic alone (not considering the 1073 pre). Before testing the emulations we moved on to a similar priced mic. Peter Harper (MPG’s point person in Scotland) had brought his Peluso 2247, a copy of a Neumann U47 priced at a little over £1000. Emma sang a third passage. Again, listening back gave a musical and present sound. As we had the backing track available too it was easy to see how the mics sounded in a mix rather than exposed and isolated. Interestingly, on Emma’s voice, we found the Peluso 2247 to be brighter and more detailed in the top end than the Bock 251, not what you’s expect from the real 251 and 47. However, this event was not about that! The Bock and Peluso mics both produced a pleasant, musical “quality” sound, whereas without modelling, the flat Slate system lacked body an seemed a little over detailed and less pleasing to the ear. It was time to give the Slate mic it’s chance to shine and play with the emulations. It made sense to choose the Neve 1073 software pre amp and select the emulated Telefunken 251 to see how it stood up to the Bock 251. We were all pleasantly surprised. It was a good sound. There were obvious differences (which you would expect between any two differing mics) and a few of us chose to try to blind test to overcome any psychological aspects of pricing or modelling. There is a slider on the software, that starts at 100% and goes to 150% (how Spinal Tap!) What does it do? This was the next question on the list for Steven. As you’d expect though in a situation like this, when you don’t know what something does you have to play with it to find out! It seems to exaggerate the characteristics in every way. Pushing it to an almost cartoon level at 150%. Bringing the slider to around 120% though seemed to bring in something very musical. We spent a good while flicking between the Slate and the Bock. It was a very close and subjective call but most in the room felt there was just something more pleasing in the Bock. We felt that the Slate system had a little too much synthetic tube harmonic emulation in the top end making it just a touch less pleasing. The sort of sound that at first may be exciting but becomes fatiguing quickly. Was it so much so that you’d pay 5 times the amount for the Bock? It was a mixed bag in the room. Next up was the U47 on the Slate. The sound was completely overdriven and distorted!? There was clearly no distortion on the original recording. The Neve emulation has a ‘drive’ dial. Reducing this we quickly reached a compatible level. the sound was very round and warm but let’s not forget, we found the Peluso 2247 rather detailed and bright for a 47 copy (not unpleasant though). Again, in the room we were impressed but the room was split as to whether or not the Slate gave that ‘quality’ sound. Speaking personally, in many inexpensive mics I find the top end over detailed, unmusical and fatiguing and as soon as I try to eq that out it’s like a water bed! I could hear a similar quality in the Slate. So that’s where we went next! We were monitoring through Chem19’s SSL 948 AWS desk so we patched in the eq and afore mentioned Teletronix LA 2A for compression. The emulations sounded even more balanced, natural and ‘quality’. 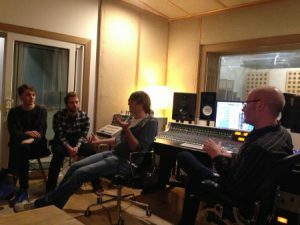 The 251 in particular matched the qualities of the Bock very well, sounding great in the mix. So we decided to experiment replacing the outboard with software eq and compression, turning to UAD’s LA2A and Pultec Pro. Again, with little effort, the vocal sounded very good. Even those sceptics were starting to change tack. As we were flicking through, it was apparent that each had differing colour and character but when we reached the AKG C12 emulation the sound of Emma’s voice changed in a magical way. There seemed to be more emotion. the words seemed to respond to the characteristics of the sound in a better way. It was apparent that this system provides a powerful palate! The laptop rang and it was time to talk to the man himself, Mr Steven Slate. How do you emulate this system? is it component based or do you emulate the entire signal? We do both! We keep going, improving both component and complete signal, testing, teaching the algorithm for around two and a half years. Can you compress the signal on the way in? Unfortunately not, if you do the emulations just don’t sound good. However there is a work around. Use a really low buffer size and follow the VMS by a hardware insert out to your outboard. (We didn’t have time to experiment with this). What’s with the 100-150% slider? It exaggerates the tube characteristics. 100% is the accurate emulation but we find there’s usually a sweet spot between 115-130%. Is there any dynamic processing to the signal in the modelling, such as compression? No. It’s modelled as accurately as possible. Before saying our goodbye’s there was just enough time for Steven to draw the winner of the Slate Virtual Mix Rack (kindly donated by Slate Digital to one lucky attendee). Upon arrival, every attendee was given a number and Steven selected one in the range at random. The lucky winner was William Jamieson! Is the VMS system a $1000 replacement for a £50,000 mic locker? I think we’d all agree that it isn’t. 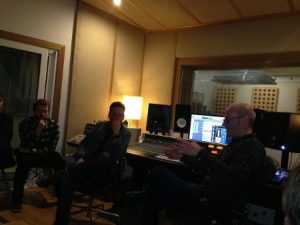 Does the VMS provide you with a wealth of creative palettes not only during but post recording should you need it – YES! Is it any good? I think we’d all say – yes. Moreover, this is only the start and I’m sure the system will only improve as time goes on. The evening progressed into social conversation and networking for another two hours or so. I think everyone agreed it was a tremendous success and we look forward to the next one. A big thanks to our panellists Paul Savage and Paul McGeechan, everyone at Chem19, Emma Pollock, Peter Harper, Andrew Hunt and of course Steven Slate and everyone at Slate Digital.